As air travel using conventional passenger air liners comes under increasing critism for being environmentally unsustainable, older technologies are beginning to be re-examined. One such technology is airships. Researchers at the Tyndall Centre for Climate Change Research estimate that, even when powered by fossil fuels, the total climate-changing impact of an airship is 80% to 90% smaller than that of ordinary aircraft. 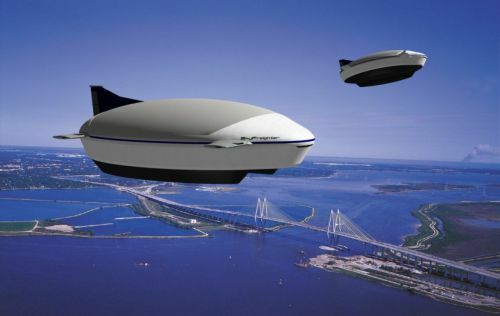 Hydrogen gas figures prominently in the development of this new generation of airships. The airship is the only form of transport that can easily store hydrogen gas, with its low density. The use of hydrogen fuel could help overcome a problem with traditional airships - they become lighter, and therefore harder to control, as fuel is consumed. One potential solution is to inflate a hydrogen bladder inside the helium balloon. As this fuel was consumed the craft would become heavier and therefore, by burning both gaseous and liquid hydrogen the weight of the craft could be kept constant throughout the journey. New airships have much in common with conventional planes, making use of aerodynamic lift as well as buoyancy. This aerodynamic lift is provided by small wings and the general aerodynamic shape of the craft. They are heavier and more stable than older airships and can land without help on the ground. They can land on and take off from almost any flat surface, including water.